Similar to commissioning artists for their unique abilities, Billiards by Brandt clients can commission Dan for one-of-a-kind pool tables made precisely to their liking and desired specifications. “Billiard tables are not only art, but also can showcase art,” says Dan, and no better illustration of this is the table he produced to exhibit internationally acclaimed artist Walter Gaudnek’s painting “St. Denis and Goya’s Missing Skull” as billiard cloth. He’s also the expert go-to whenever there is a special request. Just ask Linda Hein, SVP of The Parker Company. Whether it is a lacquer white billiard /dining table with matching shuffleboard for a Miami luxury condo, or leisure gaming equipment for use on private islands, she contacted Dan who made it happen on time, and also oversaw the installation. Billiards by Brandt produces all items cradle to grave under Dan’s direction and supervision, and ensures clients an efficient process by having him as the point of contact in all transactions. Dan helps guide architects, designers, developers and even inspired homeowners towards the table they envision. And once production begins, an open invitation is extended for all clients to tour the workshop and see their tables being made. As recently described in Indulge Magazine, Dan Brandt is a Renaissance man with a hint of Santa Claus. He’s a lawyer and lobbyist. He reads Homer and quotes Plato. He’s a gentleman who gracefully opens doors. And he is the go-to guy when rock stars, athletes and even luxury hotels are searching for that perfect toy — a one-of-a kind billiards table. 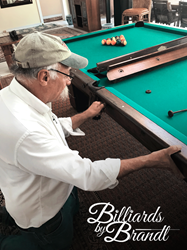 With a fluffy white mustache and kind eyes behind his spectacles, the 67-year-old builds, restores and tinkers with pool tables in his Santa-esque workshop. This man cave — bursting with stacks of slate and wood beams dating back hundreds of years, turn-of-the-century screws, and dismembered pool tables — resembles a whimsical museum. The Michigan native wasn’t born with a silver spoon in his mouth, but rather an ivory teething ring made from billiard ball scraps. His father was a Brunswick service manager for almost 20 years before moving to South Florida in the ’60s to start his own pool table business, where his clients included royalty and A-list movie stars. Dan took a different route. He became a legal aid attorney and practiced environmental law before moving to South Florida in the ’80s to learn his dad’s business. Today, he still uses a level his father made 50 years ago, and he’s teaching his son all his secrets to conserve and restore his works of art. When The Rolling Stones were in town, Dan installed a snooker table backstage so they could play before the show. His masterpieces have also been commissioned by Al Gore, Pat Riley, the Miami Heat, Fontainebleau Miami Beach, Delano South Beach and HBO’s Ballers. During the rare occasion when he’s not working on a table, Dan is restoring a 1964 Volvo 544, which he’s been working on since disco ruled the airwaves.